I have been sick this entire week. Colds make me stupid. I hope this post makes some sense! I did rally to review the lessons which arrived but I spent most of the week coughing, sneezing and complaining. 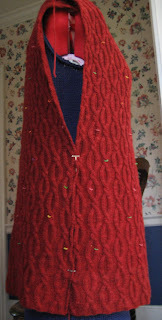 I had hoped to finish up the pattern for the Vlad tunic but I have put it off until I am thinking more clearly. My other goal was to start on the handouts for the Mackinac course. The handouts will be a complete reference guide for finishing. I am quite excited about them. Maybe next week...if this cold EVER goes away! Again, if you have ordered this class any time that I have been the instructor, I am happy to have you continue. You don't need to contact TKGA to ask for permission. Just send me an email or a message through Ravelry and I will be happy to send updated materials. If you have completed any of the lessons, let me know. The tips for the first three weeks discussed how to improve ribbing, seed stitch and cables by bringing the working yarn forward very tightly when changing from a knit to a purl. For some knitters, this can be difficult due to hand issues or how they knit. This week I will discuss another technique you can try. 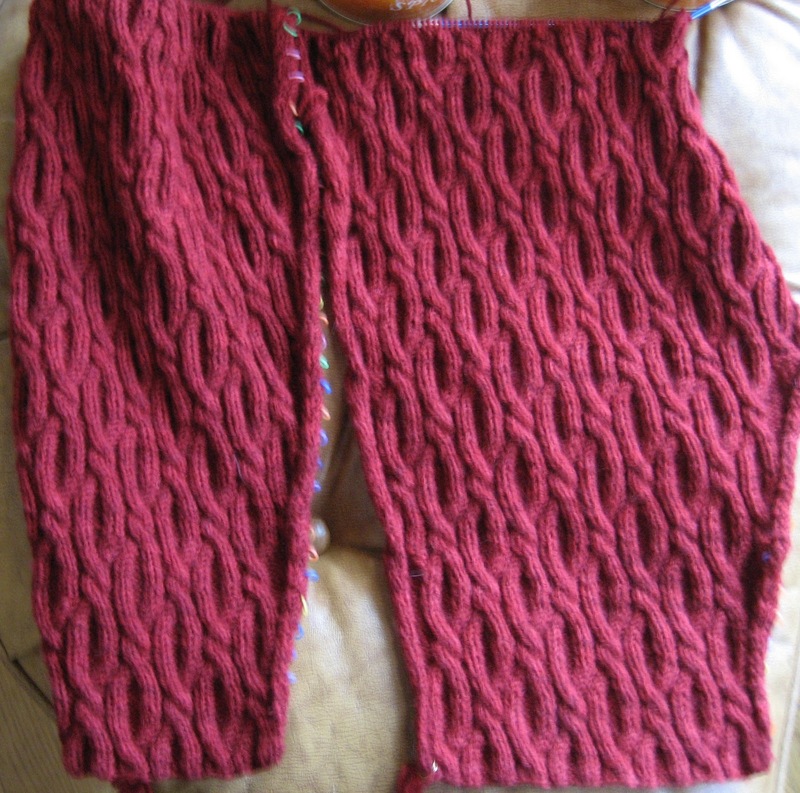 The other ribbing samples were K2P2 ribbing. 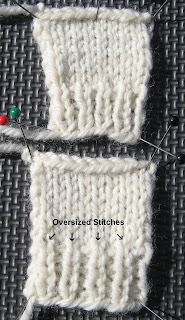 It is easy to identify over sized stitches in K2P2 ribbing since the stitches in the second column of knit stitches are so much larger. It is a little more difficult to see this in K1P1 ribbing. K1P1 ribbing should be tight with the purl stitches barely visible. If you compare the two examples you can see the difference. 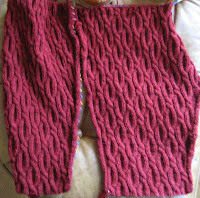 Another thing you should look at is the size of the knit stitches. In both the Basics class and Level 1 of the Masters program there is a stockinette swatch with K1P1 ribbing. 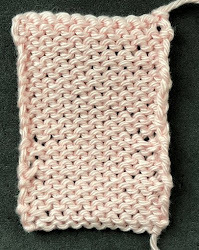 When you do these swatches, compare the size of the knit stitches in the ribbing to the knit stitches in the stockinette portion. They will never be the same size but if they are significantly larger you may want to give it another try. How do you you fix this? You can bring the yarn forward tightly as discussed in the previous Tips but if that isn't comfortable or doesn't work for you, try this instead. When you go to work the purl stitches, instead of wrapping the yarn OVER the needle as you normally would, wrap the yarn UNDER the needle instead. 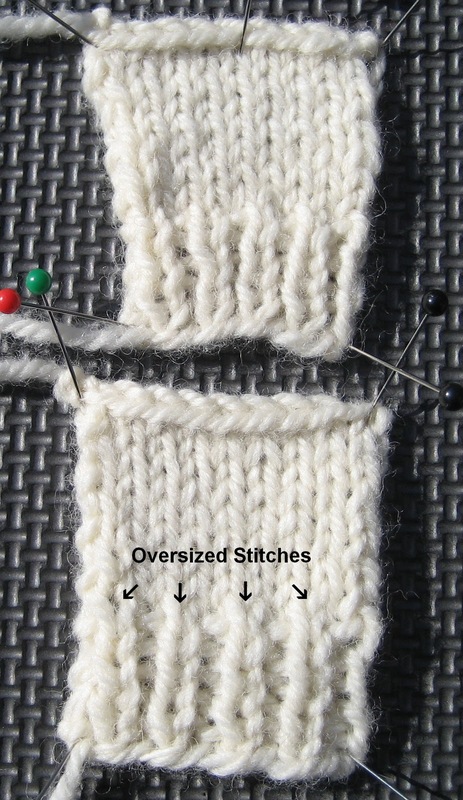 Look carefully when you do this and you will see that this significantly reduces the amount of yarn in the stitch. It also forces you to bring the yarn forward more tightly. The important thing to remember is that this alters the position of the resulting stitch on the needle. Normally, the right leg of a stitch is on the "front" of the needle. When you wrap the stitch the opposite direction, this places the left leg of the stitch on the front and if you work the stitch as you normally would, it will twist the stitch (not a good idea). When you use this technique you must work the resulting stitches through the back if you do not want twisted stitches. Also try to use just the tips of the needles. This helps keep the stitches small as well. Many knitters routinely do this for purl rows to correct tension issues. It is called combination knitting. Others use it only for ribbing and seed stitch or for the first purl stitch following a cable. Salon will be on Saturday this week. There is a basketball game but it is an away game at 6 pm. It was a choice between the Wildcats or the Superbowl. The front and back of the tunic are finished and blocked. I spent the week on the sleeves. Luckily, they didn't require much thought. Colds make me so stupid. There is no way I can do the pattern until my head clears. As it is, I had to rip out the sleeves after about 6" as I needed to adjust the increase placement. Since I was too sick to do much else, I just knit and watched crap television. I finished up last night. I just have to block them. I should have the tunic finished by Sunday. The only thing left for the next issue of Cast On is the over-the-knee socks. I am doing an article on jogless joins with a pair of striped socks. My daughters informed me that over-the-knee socks are quite the thing now. They shouldn't take long. I pinned the pieces to the dress form. I've haven't cut out the dental elastics yet. I placed them at the decreases so I can write the pattern. The notes I make when knitting aren't that great. I find it much more useful to write the pattern from the garment. Hope you are feeling much better soon. Love the color on the tunic. I Do Hope you are feeling bright and ready for your days again soon, Ms A!! Love the Current project you are designing!! !